Feast your irises on this! The lucky citizens of Japan have been playing the epic 3DS title Fire Emblem: Awakening since April now, while in North America and Europe release details are still sketchy at best – sometime in 2013. 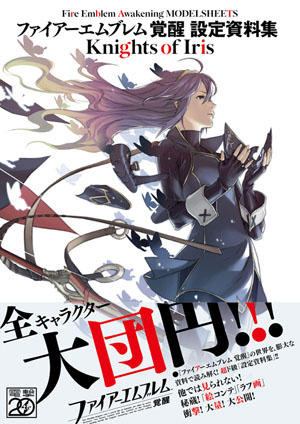 As if gamers in Nintendo's homeland weren't fortunate enough, it’s now been revealed that Japan will be getting even more Fire Emblem: Awakening goodness before the year is out, with the release of a new art book called Knights of Iris. Artist Yusuke Kozaki broke the news when he shared the book’s gorgeous cover illustration on Twitter. This awesome looking book is stuffed full of event illustrations, character art, soldier sketches, weapon designs, and special illustrations from when the game was in the infancy of its development. Knights of Iris will be released in Japan on 7th December for 3,990 Yen, which is around $50. Will you be hoping to get your hands on it in the future? Really like the art, but my current financial situation prevents me from getting that. As an American I feel teased. I want this and just might get it. Why is her hair pink? I mean, the system in awakening is that the kids have the same hair color as their dads, so why is Lucina, Krom/'Chrom's daughter's hair pink? Or is it just weird lighting? "Feast your irlses on this..." Major spoiler that in which gives away the biggest twist in the game. Not exactly smart NL. @ShinRPGfan4657 Without you comment that wouldn't have spoiled anything. Good job.